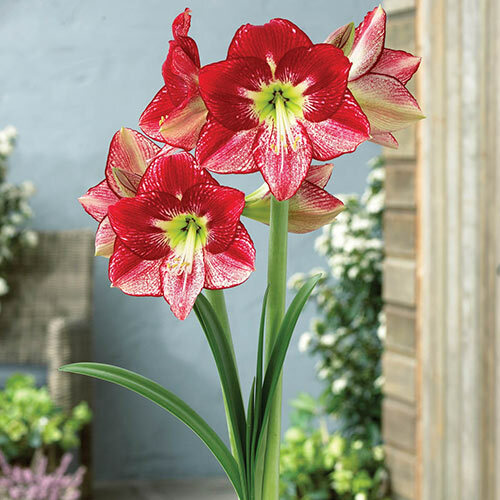 Amaryllis… just the name is exotic. 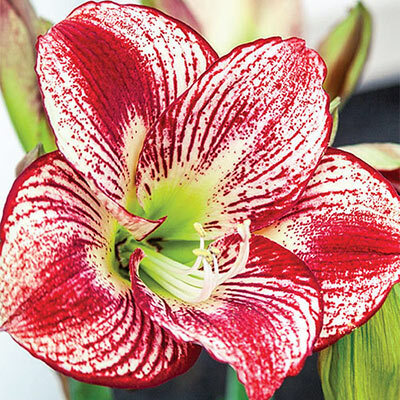 Our new Flamenco Queen is a rare beauty that displays a lively coloration featuring bold red brush marks, fretting and edging—all highly desirable patterns in amaryllis. In fact, this variety was specially bred to provide indoor beauty and color through the dull days of winter. It bears its big, feathered and streaked blooms of snowy white and cherry red a mere 6-8 weeks after growth begins. Cool green centers add an extra pop of color. Like other amaryllis, this newcomer makes a fun and interesting addition to the home during the holidays, and it makes a great gift, too. Flamenco Queen is easy to grow and comes up fast. Wide strap-like fleshy leaves begin its growth during and after flowering.